If you are a soccer fan and looking for a complete guide for Dream League Soccer game, then check out this post. Now in this post, we are providing wiki info on guide for dream league soccer video game. Dream league soccer is an association football video game. The DLS game was developed and published by First touch Games. The game is available for iOS and Android devices. Initially this game was released on 26 February, 2016. Every year the game updates its older version with new features. This is a free to play game, in this game you start as the manager of a team called Dream FC which consists of random players. DLS game allows you to build your own dream team. In DLS game there is an option of earning coins to develop your team either by training them with the player development program or signing new players. Your aim in the game is to reach the fourth division all the way up to the Elite division completing different season objectives. You can also take part in friendly matches, the global challenge cup, and other competitions. The game also allows you to customize your teams with latest logo and kits which will be updated officially by the developers every year. 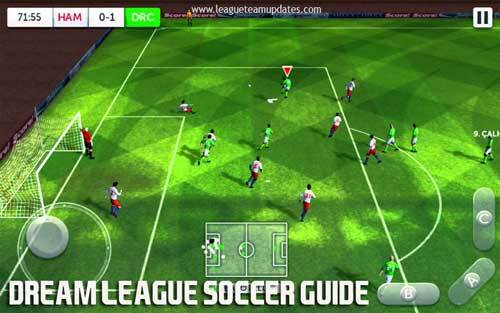 In this gameplay you will know the complete guide for Dream League Soccer. The controls of the game are explained in detail in the tutorial, you can also prefer to see the tutorial again by following process start a new game, pause it, go to settings and then select controls submenu and see there what each of the buttons do. There is also an option where you can customize the controls to suit your style of play. The game play has metal enhanced graphics which look great for a mobile game. The DLS game provides you the facility to play game in training mode. By playing in training mode you can get the grips with the games control scheme. The training mode not only provides you training to improve your shooting and passing skills but it also allows you to practice penalty shootouts, saves and free kicks. The DLS game also provides you an amazing feature to play game in multiplayer mode. By playing game in multiplayer mode you cannot gain coins but it is still a good way to improve your skills playing games against other human players. The gameplay allows you to upgrade your stadium. By upgrading your stadium strands whenever possible you can increase the crowd capacity so that this will earn you bonus coins in home matches. Coins will be rewarded to you when you win a match, number of goals scored by your players, your goalkeeper does not concede a goal and for wining an achievement. You can also see whether your player are in correct position or not, you can check that by seeing color icon on your players of your team. If your player is in the right position then the green icon will be displayed on your player. If your player is in the wrong position then a red icon will be displayed on your player. By seeing the red icon on your player you can consider moving them or changing the formation of your team. You can also do trades and transfers in order to make things as green as possible. The game play also allows you a wonderful feature of developing players. You can develop your players by training them in the player development section by spending 50 coins for a session. As this is expensive upgrading your existing players will let you not to transfer in many other players. The players who are popular will have little above market value when compared to remaining players. You can transfer your players by spending some coins on the best players. The players with high stat score will be right for the formation of your team plays in. You can also use the defending feature in the game when your players are defending and trying to get back possession of the ball by using the B button more than the A button. By holding the B button the player can put a pressure on the ball where as by holding the A button the player perform a slide tackle. Mistimed slides tackle result in a yellow card or a warning from the referee. The difficult task in the game play is shooting on goal, by shooting it takes ball control and being able to stop the indicator at a length that is just right for the goal distance. You will get more success when you play extraordinarily and take the ball as close to the goal as you can before shooting. The game also allows you to select the team captain on your choice. Select the option to create a team when you are given the choice to either select or create one. This will give you an automatic overall rating of 80 for your created player and you can also customize your teams. You can reach top position in the game just by getting promotion. When you are promoted you will go to the next division of the game from your currently playing division. If you are not promoted you will be playing the next season in the same division. You can also earn free coins on this game. You can earn 10 free coins just by connecting your game to social media sites like Facebook or Twitter or you can also earn 30 coins free by watching an ad video. The ad videos will be refreshed for every two hours. By completing the three-game objectives you see on the roster screen before the game starts you will earn free coins. You can earn free coins by completing the tasks anything from scoring in the first half to limiting the opponent to a certain number of goals. You will also earn free coins by completing season and career objectives. You can also earn free coins by playing tournament games. It is not recommended to spend real money to purchase coins, you are able to get a fair coin just by winning games and watching the ad videos. You can save your coins by transferring your market so that you are able to buy skilled players which will help you to gain success in your game. Draw a total of 10 matches. Sign a player on a free transfer. Purchase a player worth over 600 Coins. Purchase a total of 5 players for your Dream Team. Purchase a total of 10 players for your Dream Team. Go an entire league season without receiving a red card. Go an entire league season without receiving a yellow card. Spend a total of 500 Coins on players for your Dream Team. Spend a total of 1,250 Coins on players for your Dream Team. Spend a total of 2,500 coins on players for your Dream Team. Spend a total of 5,000 coins on players for your Dream Team. Spend a total of 10,000 coins on players for your Dream Team. Earn a total of 250 coins. Earn a total of 1,000 coins. Earn a total of 2,000 coins. Earn a total of 5,000 coins. Score a total of 10 goals. Score a total of 50 goals. Score a total of 500 goals. Obtain 250 Dream Team ranking points. Obtain 500 Dream Team ranking points. Obtain 1,000 Dream Team ranking points. Obtain 2,500 Dream Team ranking points. Purchase a total of 20 players for your Dream Team. Purchase a total of 100 players for your Dream Team. Purchase your first stadium upgrade. Finish a league season with +50 Goal Difference. Score a total of 15 goals with a single player in a league season. Score a total of 30 goals with a single player in a league season. Obtain 5,000 Dream Team ranking points. Obtain 10,000 Dream Team ranking points. Obtain 100,000 Dream Team ranking points. Spend 250 coins in Player Development. Spend 1,000 coins in Player Development. Spend 2,500 coins in Player Development. Finish top of Division 3. Finish top of Division 2. Finish top of Division 1. Win the Double a total of 5 times. Win the Treble a total of 5 times. Win the Double a total of 10 times. Win the Treble a total of 10 times. Win the Double a total of 50 times. Win the Treble a total of 50 times. That’s all about the guide for dream league soccer. Follow this article for better understanding and playing the game. If you have any queries please do comment in below comment box, we will reach you as soon as. Thank you for visiting our site LeagueTeamUpdates.